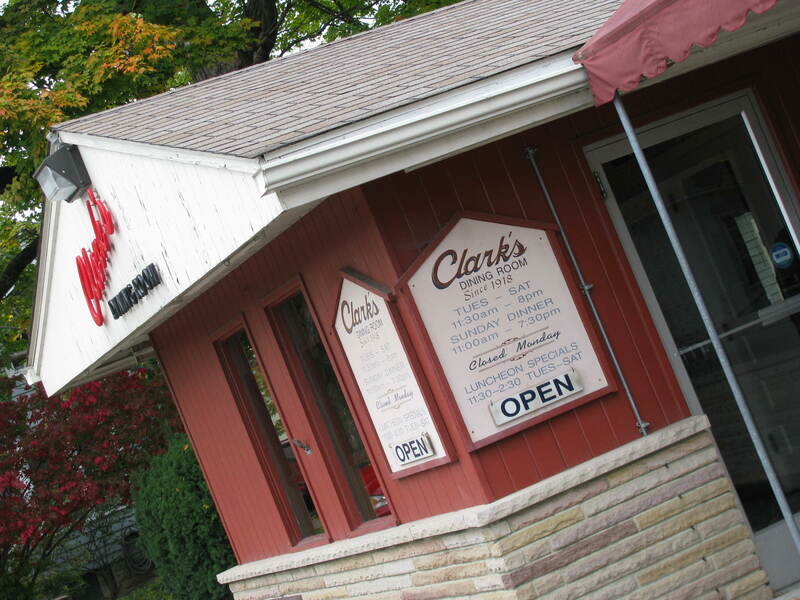 Reputed to be one of the best places for fried chicken in the state of Ohio, Clark’s is a 91 year old institution, but if you want a taste of their traditional comfort food, you only have four days left. Clark’s will close their doors for the last time on Sunday evening, November 1st. 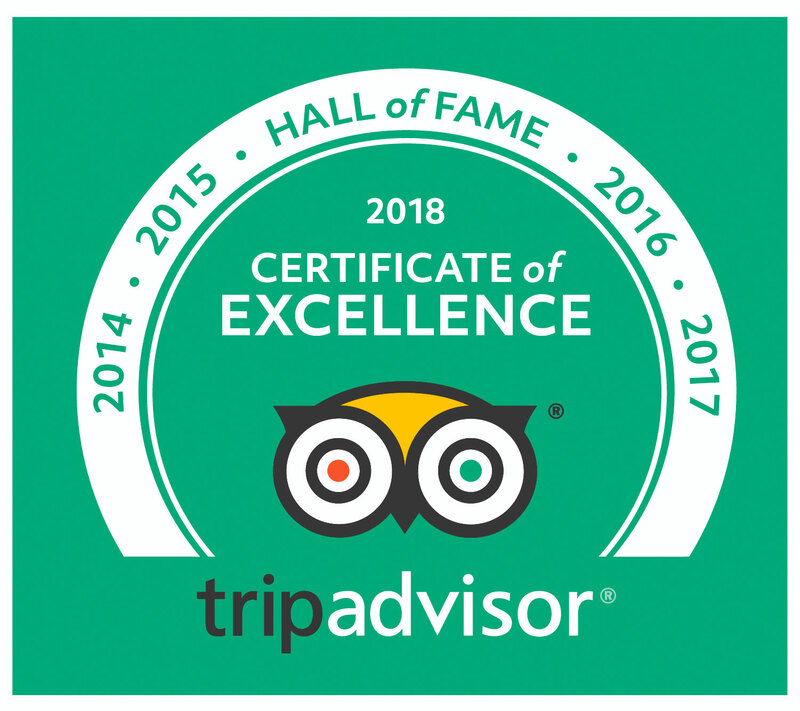 If you are a fan of fried chicken, have been meaning to visit Clark’s, or if you want a taste of nostalgia, put it to the top of your to-do list now. Clark’s is found about an hour east of Columbus, on old route 40 in Jacksontown and very close to Dawes Arboretum. Chances are you will have to wait, maybe a long time. 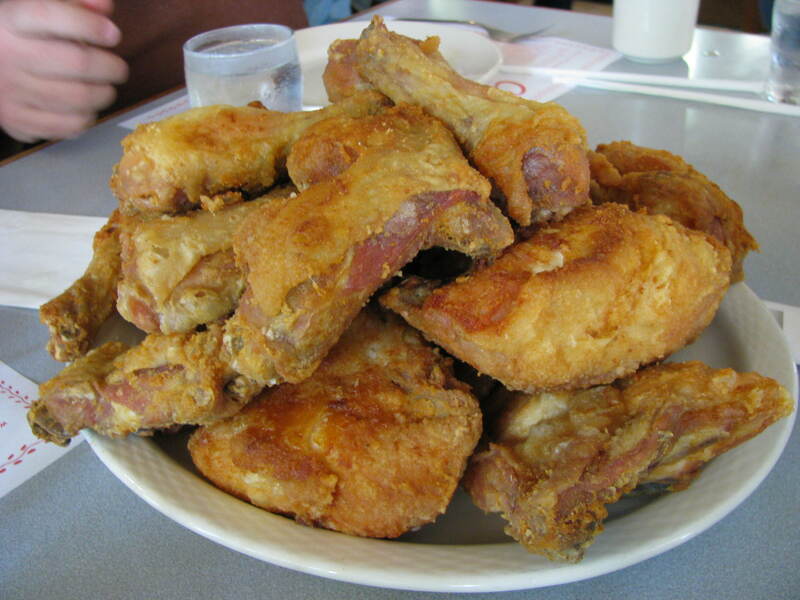 A lot of people want a taste of iron skillet fried chicken while they still can. On our visits there the wait was anything from 45 minutes to an hour and 45. The menu is simple: chicken, steak or ham. You get a full dinner served family style with a choice of salad, coleslaw or apple sauce to start, mashed potato, gravy and vegetables, followed by pie. While there are other choices, it is really all about the chicken. Four pieces per person of salty, crispy skin with tender steamy chicken underneath. Everything at Clark’s is made from scratch each morning – they section the whole chickens, peel and mash the potatoes and bake every kind of pie you can think of. It’s not unknown for them to sell out before closing time. I mentioned pies and the day we visited there were 14 on offer. 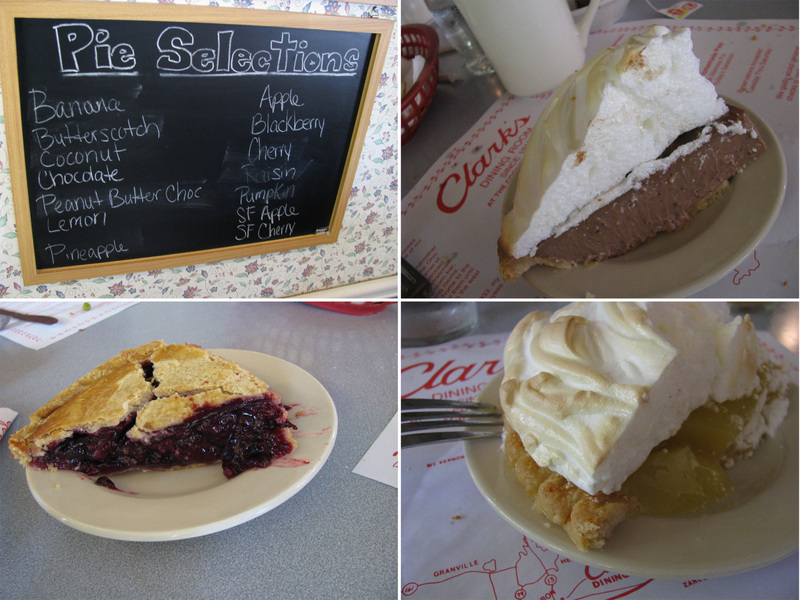 My favorite (although I admit to only trying a couple) – and one of the most popular was the chocolate cream pie. Hell, what’s a few more calories after a plate full of fried chicken. a) that Clark’s is claimed to have the best fried chicken in Ohio. b) that Clark’s was about to close. You won’t be surprised that I dragged my friends back there the next day. We were prepared for the wait but on sunday it was even longer: almost 2 hours. Our patience and determination were rewarded – when others left the line and we were seated within an hour. Is it the best in Ohio? It certainly was good although I can’t say I have sampled enough to judge. 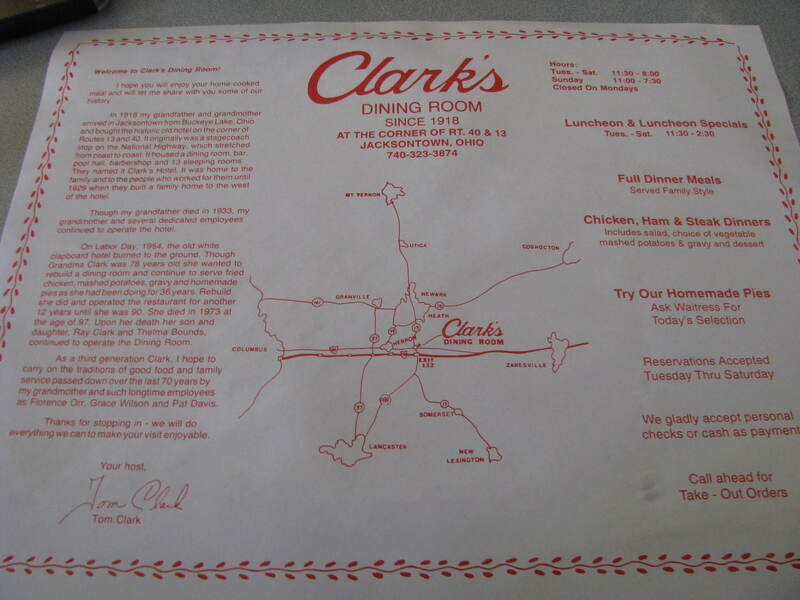 Restaurants come and go, but it is sad when somewhere with as much history as Clark’s is forced to close. It is obvious that it will be missed, and not just in Jacksontown. Oh man! That third picture has got me salivating. i went with my family about a year ago. we thought the chicken was okay, but all four of us got different kinds of pie. all were terrible–pineapple cream was the absolute worst. According to Nigel on BBC Radio 2’s Drivetime, people should pay more for less chicken, making sure it is humanely reared and fed on natural produce. That way, flavor is insured. 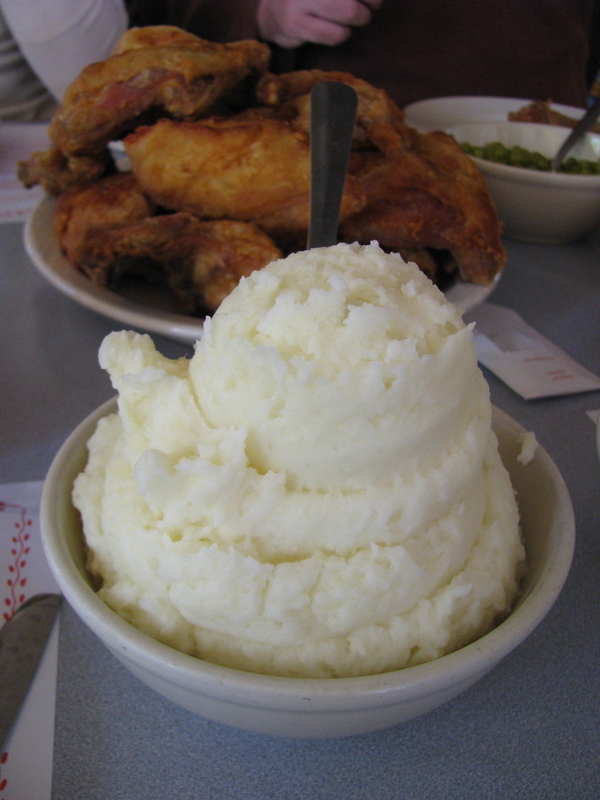 Let’s be honest, unless you’re a manual worker who’s missed a meal, you don’t need four portions of fried chicken and potatoes and pie! Don’t worry fried chicken (in any quantity) isn’t something I eat with any frequency… and we did bring a doggie bag home. I would love to get a copy of the cookbook, but can’t find out how. My 97 year old dad loves their fried chicken. Any suggestions? I’m so upset this restaurant has closed. I just discovered it about 3 months before.